Certain sub genre's of horror feel so over mined and exploited that its hard to imagine what a fresh take on the material would look like. After the success of THE LAST EXORCISM the market was flooded with low rent imitations that felt like nothing more than cynical cash grabs. With that in mind lets take a look at AVA'S POSSESSIONS. Ava Dobkins has no memory of the last month of her life. She is in recovery, trying to reestablish some semblance of normal. Demon possession takes a toll on an individual and Ava is determined to reclaim her former self. The overt addiction metaphor and 80s synth score make this more than your average horror outing. Director Jordan Galland seems to revel in tweaking genre tropes, he is fully aware of what we expect from his films and takes pride in subverting that expectation. With ALTER EGOS he took the super hero genre and made a film about jealousy and isolation. He uses off the wall premises to make effective statements and AVA'S POSEESIONS continues that trajectory. The film is ostensibly about demonic possession but its actually concerned with the aftermath of trauma. The movie is also whip smart and funny. I can't think of any other horror/comedies that effectively balance the gore and laughs while having more to say. Some of the themes are spot on to the point that some might find them distracting but keep in mind this film is satirical. Its not self important or pretensions, this film is well aware of what it is and wears its colors with pride. 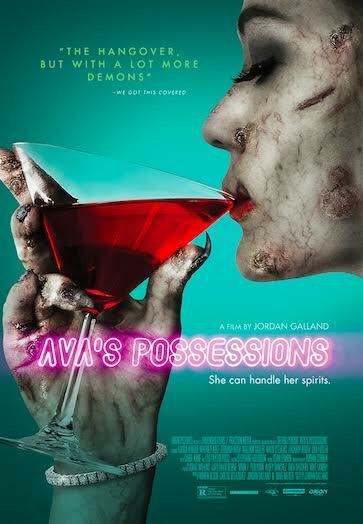 If you are looking for something original this weekend look no further than AVA'S POSSESSIONS, its currently available on VOD.